Orfenac-TR capsule: Each timed release capsule contains Diclofenac Sodium pellets equivalent to 100 mg Diclofenac Sodium BP. Orfenac Plus Injection: Each 2 ml ampoule contains Diclofenac Sodium BP 75 mg and Lidocaine HCl USP 20 mg.
i) Arthritic conditions : Rheumatoid arthritis, osteoarthritis, ankylosing spondylitis, acute gout. ii) Acute musculoskeletal disorders such as periarthritis (e.g., frozen shoulder), tendinitis, bursitis. iii) Other painful conditions resulting from trauma, including fracture, low back pain, sprains, strains, dislocations, orthopedic, dental and other minor surgery. 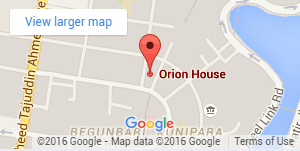 Orfenac plus injection also contains Lidocaine, which acts as a local anesthetic. Therefore, the possibility of pain at the injection site, which is most likely to occur after intramuscular injection of normal Diclofenac, is minimized if Orfenac plus injection is used. Diclofenac is contraindicated to the patients with active or suspected peptic ulcer or gastrointestinal bleeding and hypersensitive to Diclofenac Sodium. Orfenac should not be given to patients who have experienced asthma, urticaria or other allergic type reaction after taking Aspirin or other NSAIDs. Because of the presence of Lidocaine, Orfenac plus injection is also contraindicated for those patients who are hypersensitive to local anesthetics of the amide type, although the incidence is very rare. In patients with Adams-Stokes syndrome or with severe degrees of SA, AV, or intraventricular heart block in the absence of an artificial pacemaker this injection is also contraindicated. 1 Capsule daily, preferably at meal times. Children: 1-3 mg / kg body wt. daily in divided doses. Elderly patients: In elderly or debilitated patients, the lowest effective dose is recommended. Adults: One ampoule once (or in severe cases, twice) daily by intramuscular injection. ampoule may be administered after 30 minutes, if necessary. The recommended maximum daily dose of Diclofenac is 150 mg , by any route. The recommended maximum daily dose of Lidocaine is 200 mg.
Children : In juvenile chronic arthritis, 1-3 mg of Diclofenac/ kg body wt. daily in divided doses. Caution is required for patients with peptic ulcer, edema and renal insufficiency. Orfenac should not be prescribed during pregnancy unless there are some compelling reasons to do so. Following oral dose of 150 mg daily, Diclofenac passes into the breast milk, but in quantities so small that no undesirable effects on the infant are to be expected. Drug interactions may occur with Lithium, Digoxin, Anticoagulants, Oral antidiabetic agents, Cyclosporin, Methotrexate, Quinolone Antimicrobials, Aspirin and Potassium-sparing diuretics. Orfenac-TR capsule: Box containing 5 x 10 capsules in blister pack. 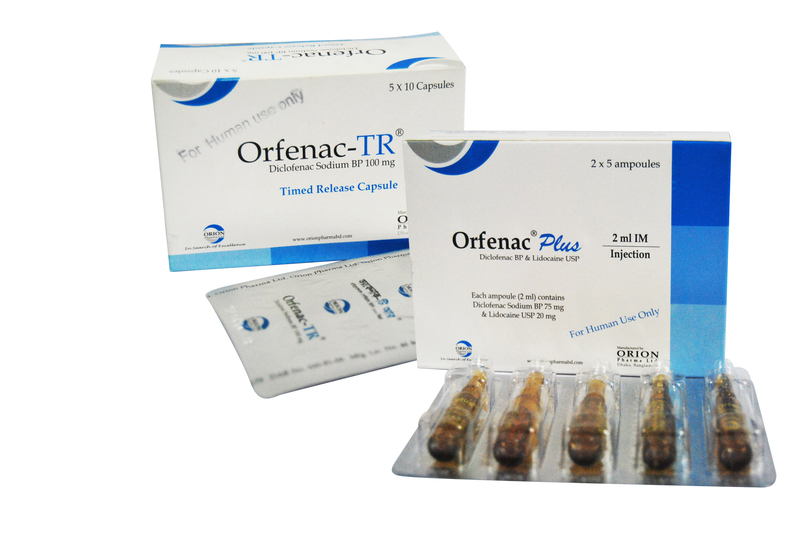 Orfenac Plus Injection: Box containing 2 x 5 ampoules in blister pack.